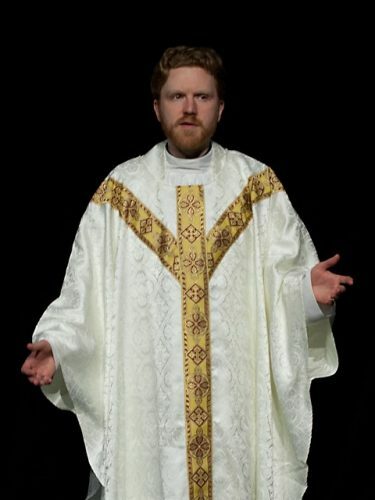 Evan Crump as Father Flynn. Photo Credit: SeeNoSun OnStage. “Sometimes things are not black and white,” as written by John Patrick Shanley in his provocative drama, “Doubt, A Parable.” But, what if the shades of gray involve a priest accused as a child molester, but with no hard evidence to prove so? Add to this an infusion of complicated issues such as race, male dominance, and morality, to name a mere few, and you have a richly confrontational plot that will rouse your deep-seated beliefs and stimulate you to question just what is just. SeeNoSun OnStage’s production, directed by Michael Wright, shows strength of performance chemistry and technical value. Set in 1964, a time of progress and revolutionary change, “Doubt, A Parable” takes place in the Bronx at the fictional St. Nicholas Church School. The play opens with a sermon by Father Flynn, parish priest, about doubt as a sort of peculiar virtue. The plot then introduces us to Sister Aloysius, the staunch and cynical principal of the school suspicious of all things youthful and progressive (like those appalling new ballpoint pens she so despises), and her counterpart, Sister James, the naïve, inexperienced new teacher with genuine compassion and empathy for her pupils. The story then unfolds, driven by Sister Aloysius’ suspicions that Father Flynn has been sexually inappropriate with Donald Muller, the school’s first African-American student. Problem is, Sister Aloysius’ accusations are based on some rather peculiar circumstantial evidence, not fact. She is passionately convinced, however, and, along with Sister James, stages a confrontation to trap Father Flynn into confession. Aloysius also reaches out to Mrs. Muller, Donald’s mother, in hopes to convince Mrs. Muller of her suspicions. Sister Aloysius is then met with a rather unexpected reaction from Mrs. Muller, and so is the audience. Staged in Anacostia Arts Center’s relaxed and intimate black box theatre, SeeNoSun OnStage’s production, directed by Michael Wright, shows strength of performance chemistry and technical value. Evan Crump portrays a casual Father Flynn with such a depiction of warmth and love for humanity that you may wonder if Flynn truly committed the crime. His garden scene with Emily H. Gilson as Sister James exudes such a palpable connection that you feel what they feel in that moment. Wendy Wilmer’s stringent, unyielding Sister Aloysius is so wonderfully extreme that at times she’s quite comical, while Mary Miller Booker’s depth of a mother’s love as Mrs. Muller is heart-wrenching. The show’s lighting by Colin Dieck highlights intense moments throughout and underscores the complex emotional elixir stirred by this harmonious cast. Michael Wright’s staging in this show will indeed surprise you, as there are moments where the dividing line between the world of the play and the audience disappears. “Certainty is an emotion, not a fact,” Father Flynn says. Prepare for uncertainty. Advisory: Mature themes of child sexual and physical abuse. “Doubt, A Parable” runs until Sunday, June 25 at Anacostia Arts Center in Washington, D.C. For tickets and information, click here.